New York celebrates 100 years of socialist revolution | Fight Back! New York, NY - Over 100 people gathered here on Nov. 7 to celebrate the 100th anniversary of the October Revolution. The event was in honor of the win by the Bolsheviks in 1917, in which the working class seized power from the capitalists and overthrew the tsarist monarchy to form the Soviet Union. The event was organized by the 1917 Centenary Committee, with speakers from both national and international socialist organizations. The speeches talked about the history of the revolution, as well as what communists should be doing today to build revolution. 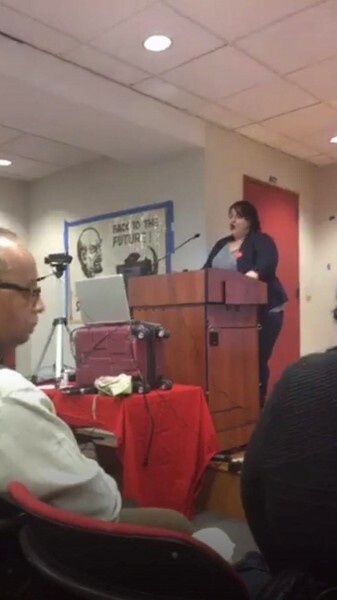 For the full speech, please visit the Freedom Road Socialist Organization – NYC page here.